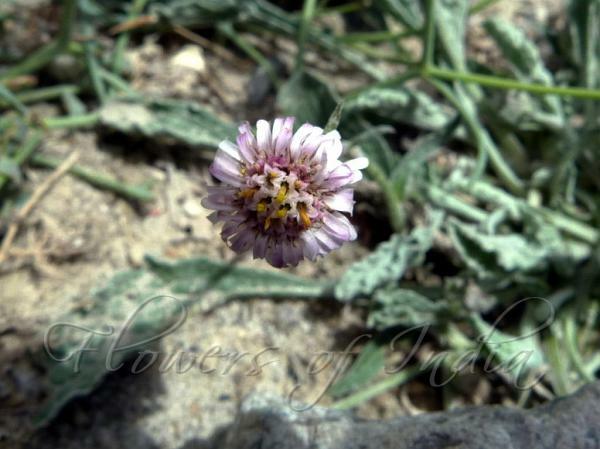 Ladakh Fleabane is a grey or white densely woolly-haired tufted perennial herb, with a stout woody rootstock and small solitary flower-head about 2 cm across, borne on short, nearly leafless stems. Ray-florets are cream, short, broad and recurved, fading to light purple. Disk florets are cream to yellow. Involucre is broad-cylindrical, bracts linear, woolly-haired. Leaves are densely crowded at the base, spoon-shaped, mostly entire, but variable, 2.5-5 cm long. Stems are usually 4-8 cm long, with small scale-leaves. Fruit is flattened, silky-haired, pappus white. 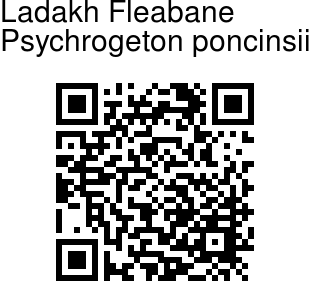 Ladakh Fleabane is found in the Himalayas, from Pakistan to Himachal Pradesh, at altitudes of 3000-4500 m. It is common in Ladakh and Lahaul. It is also found in Afghanistan, Pakistan, Russia, Tajikistan and Iran. Flowering: June-August. Identification credit: Satish Phadke, Amit Chauhan, Gurcharan Singh Photographed in Nubra Valley, Ladakh & Spiti, Himachal Pradesh.